How much influence does a play-caller have on a player's fantasy stock? The above table breaks down each active play-caller by the average PPR fantasy points scored per game at each position during their history as offensive play-caller. Each positional grouping (e.g. WR1 vs. WR2 vs. WR3) is split by total opportunities per game over the course of a full season. So when a running back leads his team in opportunities (targets plus carries) per game, he is listed as the RB1. In instances where a higher-ranking player (e.g. RB1) missed time with an injury, the next-closest player (e.g. RB2) would assume that designation in the interim. For your viewing pleasure, we also have charts on each play-caller by positional target market share preferences, total targets to each position, weighted opportunity for running backs, and general efficiency. Now, like with all football data, this isn’t perfect and needs to be taken with a grain of salt. I’m looking at (at most) a 10-season sample for each play-caller. In many instances our sample size is much smaller, and thus, our takeaways are less reliable. I’m not weighing more recent seasons any higher than seasons from the past, although we’re analyzing data from an ever-shifting NFL landscape. I’m also not making adjustments based on strength of schedule, gamescript, or roster-talent. That’s what the following analysis is for. Over a robust sample, we see a clear trend of Arians preferring to spread the ball around among his wide receivers. Over the past decade his WR1s average 24.7 percent of his team’s targets, which ranks around average (14th-most among all 29 active play-callers with experience). Meanwhile, Arians’ WR2s average 20.1 percent of the team’s targets (most) and his WR3s average 14.0 percent (fourth-most). This could prove to make Jaron Brown (ADP: undrafted) an immense value. Earlier last week, Arians referred to Jaron Brown as the No. 2 wide receiver on the team, while also talking down John Brown, who continues to miss practice with a quad injury. Historically, Arians’ WR2 (Santonio Holmes, Hines Ward, Mike Wallace, Donnie Avery, Michael Floyd, John Brown, and J.J. Nelson) has averaged 110.2 targets per season, which would have ranked 31st at the position last season. Needless to say, if we want to take Arians at his word, that’s a tremendous value for a player currently going undrafted in the majority of leagues. 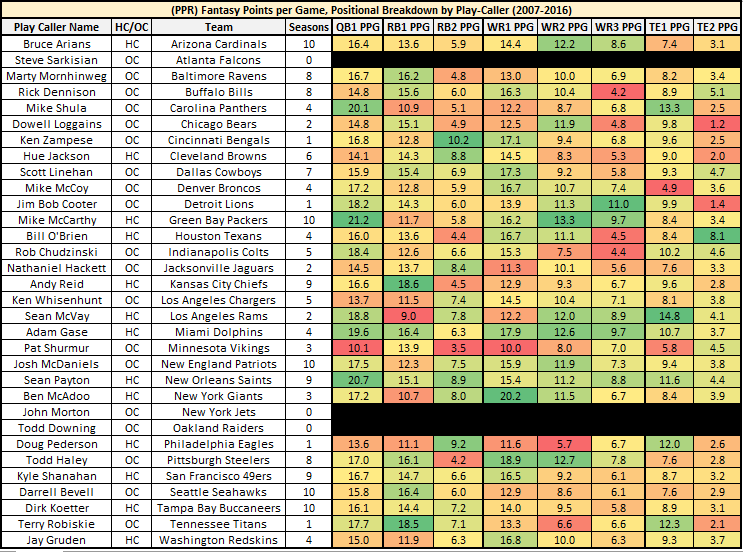 Last season, the Falcons averaged 6.69 yards per offensive play, which ranks fourth-best since 1960. The team scored 540 total points, which ranks eighth-most since 1960. They turned the ball over only 11 times all season, third-fewest since 1960. By no exaggeration, the Falcons fielded an all-time great offense last season. Due to the heights of some of these numbers, the offense was due for some natural regression regardless, but my concerns were compounded when nine-year play-calling veteran, Kyle Shanahan, left to coach in San Francisco. Shanahan was replaced by Steve Sarkisian, who has never called plays at the NFL level. Head coach Dan Quinn has continually alluded that the offense won’t look much different in 2017, but it’s hard to believe Sarkisian will be nearly as successful as Shanahan was last year. I’ve been avoiding low-upside committee backs Devonta Freeman (RB6) and Tevin Coleman (RB26) at all costs in redraft leagues.